In July of 2007, my life changed forever – by attending a workshop. I remember reading the flyer. “Best workshop I’ve ever taken,” raved one teacher. Really? I wondered how they could spend three days talking about one thing – the monarch butterfly. My colleague, Kim Lance, and I had been raising monarchs in our classrooms for a while. She’d been doing it for years and had gotten me started by giving me a couple of caterpillars each fall. It isn’t too hard to do – just give them fresh milkweed every couple of days and wait for the magic! But we thought that by going to the workshop offered by the Monarch Teacher Network (MTN) of Canada we could learn a little more about what we were doing and maybe find a new activity or two to do with our Grade 1 students. What I found in that workshop turned out to be a lot more than information about how to raise caterpillars. I found leadership opportunities and the possibility of travel all over North America participating in many incredible experiences. None of this would have happened if I hadn’t gone to Ottawa for those three days. Since that time, I have gone from having just one or two monarchs in my classroom to raising several hundred in a tent in my backyard each season. I bring them into my classroom and my students help me take care of them. Through a multitude of cross-curricular activities, they become experts on these little creatures that capture their hearts. I am able to teach them about the monarch not only through science activities, but also through literacy, math, art, music and social studies lessons. Through the tagging program run by Monarch Watch, we become citizen scientists, participating in real-life scientific research – tracking the monarch migration every year. Through a project called Journey North, we connect with students in Mexico by sending paper butterflies to be cared for over the winter months. In the spring we receive paper butterflies from students all over Canada and the United States, as well as notes and pictures from the children in Mexico. As my students help to clean containers, feed caterpillars, tag adults and release their butterflies to head south to Mexico, something else happens that leaves me in awe every year. My students develop a love, compassion and appreciation for nature in general. They want to know about other caterpillars, other bugs and other living creatures. When the school board rebuilt our school a couple of years ago, we had the opportunity to plant a butterfly garden right behind my classroom. My students had a direct hand in creating that garden and still help every year to weed and plant new flowers. This not only teaches them what caterpillars and butterflies need to survive, but also teaches them about plants and their needs. It takes them outdoors into the fresh air. One of our favourite events during the year is the big butterfly release party in the fall. We invite family, friends and community members for the celebration and release the butterflies we’ve worked so carefully to raise, sending them on their journey south for the winter. Many teachers in my school have “caught the bug” and use the monarch butterfly as a tool in their classrooms to engage students and teach them about the great outdoors. In 2010, ETFO honoured several of my colleagues and me with the “Women Who Develop Special Projects in Science and Technology Award” for the work we were doing with our students. When ETFO President Sam Hammond sent out the press release announcing our award, Global National News contacted us and asked to do a story. Our entire school became involved by hosting a giant butterfly party, which was televised across the entire country. Three hundred and seventy-five students, staff, family members and community partners celebrated the release of dozens of monarchs, sending them on their journey south to Mexico. It was very exciting for our little school in Brighton, Ontario! The opportunities for leadership through the Monarch Teacher Network have been incredible. Once you take the workshop and are trained, you are welcome back at any time as a volunteer at another workshop. I have had the chance to share my passion for monarchs with hundreds of colleagues all over Ontario and into the United States, helping to build a network of educators thousands strong across North America. I have also had the opportunity to teach in some incredible venues, such as the butterfly conservatories in both Cambridge and Niagara Falls. Because different people with different skills volunteer at the workshops, every workshop is special. We have volunteers who work in outdoor education, elementary and secondary teachers, nursery school teachers, those who do conservation work, master gardeners and even those who aren’t educators but just want to learn. Some of us know more about how to bring the monarch into the classroom; some of us know more about the biology of the monarch itself; and some of us know more about the plants needed to sustain the monarch at various life stages. Whatever our area of expertise, we all come together to create an experience that is unmatched in the world of professional development. For many years, the Monarch Teacher Network offered participants the opportunity to travel to the mountains of central Mexico to visit the butterflies they so painstakingly raised in the fall. I was fortunate to travel with MTN in March of 2008. It was an experience I will never forget. For one week, we immersed ourselves in the culture and wonders of Mexico. We visited the pyramids of the sun and the moon in Teotihuacan, toured Mexico City with its 26 million residents, danced to a mariachi band on a fishing boat, and enjoyed socializing with teachers at lunchtime on a school visit. Most importantly, we got to see where our beloved monarchs spend the cold winter months. High in the mountains of Michoacan, where millions of orange and black butterflies huddle together for warmth, we gathered together and stared in amazement at these tiny creatures that had flown thousands of kilometres on a wing and a prayer. There was absolute silence in what they call the “river of monarchs.” As we sat, butterflies would alight on us, visit for a fleeting moment, then fly away again just in time for another to land. They felt safe with us, seeming to know we had already cared for them at one point in time. It was a place I could have stayed for the rest of my life. Unfortunately, this region of Mexico is no longer safe for travellers. MTN has suspended its trips there until the political climate is better. For now, MTN offers trips to the second best place to visit monarchs during the winter months – California. Monarchs west of the Rocky Mountains do not migrate to Mexico but spend their winters along the western coastline. In January 2014, I was fortunate to travel with MTN once again, this time to San Francisco and along the shore to Carmel. The itinerary for this trip included the study of other migratory creatures such as the humpback whale, the sea otter, seals and sea lions. The sea lions were fascinating to watch. Winter is their mating season, so they are shorebound, not entering the water for months while they care for their newborn pups. We also spent time in the ancient forests and had quite the adventure piling 21 teachers inside a hollowed-out redwood giant! Throughout this journey, we met several incredible docents, volunteers who are experts on a particular area or population of animals. They work directly in the animals’ habitats, or in the area of their expertise. I decided that the volunteers with the Monarch Teacher Network are also docents – we just travel to deliver our knowledge! There are many people involved in the efforts to save the monarch butterfly from population decline. 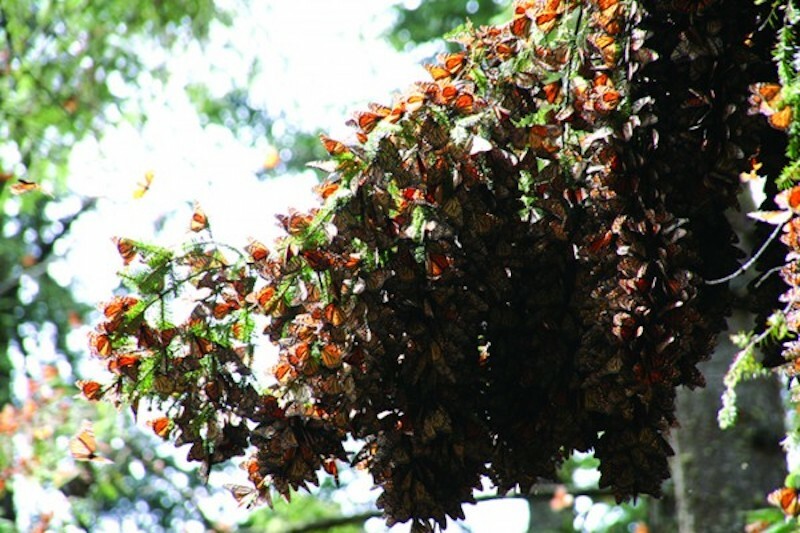 The population is measured by the area of trees occupied by monarchs, not by the number of individual butterflies. The North American population has plummeted over the past 20 years, from 20.97 hectares in 1996-1997 to .67 hectares in 2013-2014. We have been able to keep track of numbers since Canadian researchers Fred and Norah Urquhart began putting miniature tags on these tiny creatures and discovered where they were overwintering in Mexico. I have been fortunate to meet many key people in this field through my work with the Monarch Teacher Network. Last spring, I was invited by the World Wildlife Fund (WWF) to participate in a Google Hangout along with three other monarch experts: Dr. Karen Oberhauser, a professor at the University of Minnesota; Steven Price, Senior Director of Conservation Science and Practice at WWF in Toronto; and Jorge Rickards, Conservation Director with WWF Mexico. We hosted a worldwide online chat and answered questions about monarchs from our different perspectives. It was an incredible honour to be included among such a panel of experts. Another amazing project the Monarch Teacher Network is involved with is Voices from the Land. In this project, students, working in groups, go out into natural areas and create art using found materials. The process is photographed by the students or by parent helpers. Once they have created their art pieces, they work together to write a poem. The third piece of the project is drama; students act out their poem together. The photographs and the poems are put together in a book, made into posters or both. The most wonderful part of this project is that students learn how creative they can actually be. Many of them don’t believe that they can be artists, writers or actors, but find out that they are indeed all three. And, in the end, they are published authors to boot! The Monarch Teacher Network has hosted Voices workshops all over North America and Europe. The next adventure will be to take the project to Ireland in the fall. This coming year, I am excited to be expanding my butterfly garden with my students using a grant from the TD Friends of the Environment Foundation. I will also be building a permanent structure in which to raise my butterflies at home, instead of in a tent. With any luck, I will get to travel to Ireland! There are so many opportunities available to educators, even if they only want to raise a few caterpillars in their classroom. The joy on students’ faces when the butterflies rise into the sky is a sight to behold. I encourage you to bring monarchs into your classroom. Laurel Merriam is a member of the Kawartha Pine Ridge Teacher Local. There are many schools where the playground equipment is aged and unsafe. This provides an opportunity to implement a restoration program and build a learning ground. Several science and technology strands lend themselves directly to outdoor experiences. Students need to be able to make observations, collect data, and test hypotheses in nature.